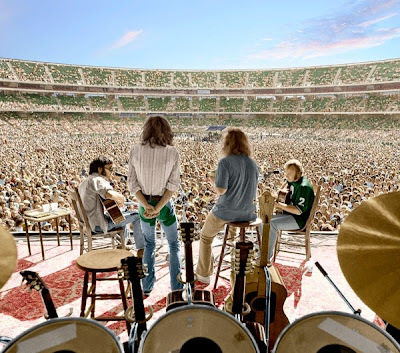 Crosby, Stills, Nash & Young's long awaited box set from the 1974 concert tour was finally released earlier this year and still providing lots of enjoyable listening -- even as the guys continue to bicker about among themselves. Quite early on CSNY 1974 clarifies that the group's democracy was a misconception pure and simple. While Crosby eventually wrote some of the most memorable of the group's latter-day songs (an early example of which here is "The Lee Shore"), neither songs of his like "Carry Me" nor those of Nash such as "Immigration Man" measure up to those of Stills even at his most facile, like this hard-to-recognize arrangment of "Love the One You're With." And Neil Young consistently trumps the other three with the haunting poetry in material like "Helpless," the result of which dynamic renders it little surprise that the unmistakable vibrancy of genuine chemistry, fleeting at best over the four hours plus total playing time , is usually most noticeable on tunes of the erstwhile Canadian's, such as "Only Love Can Break Your Heart." Intentionally or unintentionally, this (excruciatingly?) detailed archive piece may then be the most accurate depiction of the imbalance of talent and skill within this volatile set of relationships including the erratic one with its audience. As such, it may constitute an act of courage on the part of the group to release it. Se full review of CSNY 1974 in All About Jazz. 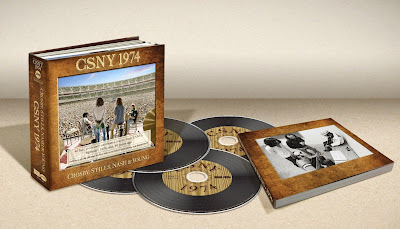 More on Crosby, Stills, Nash & Young: CSNY 1974 Box Set. They could have easily put out a great studio album. According the reviewer, Helpless" is the only song worth listening. Sounds like the reviewer has an ax to grind with CSN. And baiting people regarding the drama? I am hearing the recordings from this box set are is as bold, assertive, and as exquisite to an audiophiliac's ears as what romanée-conti is to oenophilia's lips, tongue, soul. Certainly not deserving of all the drama unfolding. Bit overwritten, but still a good assessment of the strength and weaknesses of this long-awaited album/project. True, despite the terrific production and sound, CSNY 1974, after multiple play throughs, never grips me the way Four Way Street still does.. That one was a real rock concert, with some of its flaws but all of its excitement and intensity. This one is more of a well-balanced programme, four guys showing off in a row. As a band they only start cooking on some of Neil's songs, On The Beach, Dont Be Denied and Pushed It Over The End, of course. The rest is, imho, much heat, yet little light. @ dickie - Interesting observations on 4WS & CSNY 74. Recorded so close together (relatively) and here we are 40 years later. 4WS really does stand the test of time. The question is whether CSNY 74 will be relevant in 40 years. It is amazing how songs like Immigration Man, Ohio, Military Madness etc are timeless issues -- sadly. Maybe 40 years hence, folks will listen to these quaint memories and think "Sure glad we solved those problems of immigration, police brutality, and endless war". Human-Highway.org Back Online! Rainer Lives!